We’ve been here before. New arrivals pour into a great American city as cautious locals grapple with the impact of a new and foreign presence. Some say their customs are too different – that they socialize only with each other and speak an odd language. They are accused of displacing longtime residents and squeezing public infrastructure. Others argue that the newcomers bring unique talents and perspectives. Their arrival is not a burden to be shouldered, but an opportunity to be seized. Today, this familiar debate is playing out across the Bay Area, but with an interesting twist: The newcomers aren’t poor immigrant families, but young, educated tech workers who’ve come from every corner of the earth in pursuit of their own California dream. When they first began arriving several years ago, the mood was welcoming. Deep into the Great Recession, companies such as Apple, Facebook, Google, LinkedIn and Twitter were providing well-paying jobs and creating some of the most iconic products in popular culture. What’s more, research from the Bay Area Council Economic Institute showed that each of these tech jobs had an astounding effect of creating an additional 4.3 jobs in the local economy. Due in part to this dizzying statistic, tech has elevated the Bay Area to the forefront of America’s economic recovery, plunging San Francisco’s unemployment rate to among the lowest in the developed world. Yet this success has left some people anxious, and a darker mood has emerged. According to the Census Bureau, 2013 rents in San Francisco, Oakland and San Jose shot up 21, 15 and 13 percent respectively. Evictions have increased. Somehow, it is suspected, the newcomers are to blame. 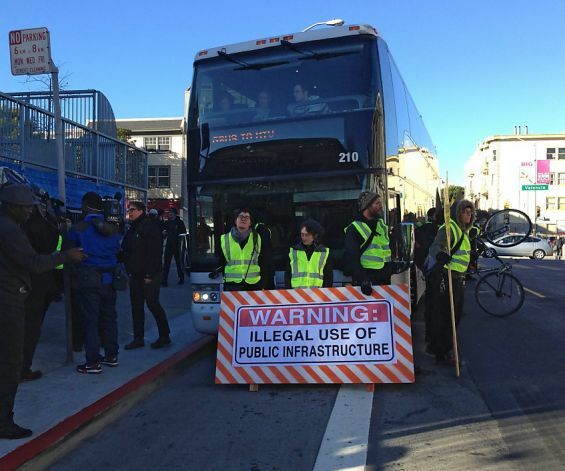 Last week, protesters in San Francisco’s Mission District surrounded a tech commuter bus and chanted antieviction slogans. It’s true: The persistent gap between the Bay Area’s housing supply and demand has drastically inflated the rental market. But blaming the tech – or any other – sector is a pointless game that solves nothing. The hard truth is that the Bay Area’s housing and transit systems are bursting at the seams. According to the San Francisco Apartment Association, last year the city added 28,800 new jobs and just 120 new housing units. Silicon Valley’s rental vacancy rates are even lower than the city’s. Between San Francisco and Silicon Valley, Caltrain operates at capacity while both Highways 101 and 280 are mired in gridlock. This congestion has ripple effects beyond the Peninsula, with huge impacts for a region where 50 percent of all employees cross at least one county line to get to work. Against this backdrop, tech’s shuttles are a godsend, eliminating 327,000 cars and 8,600 tons of carbon every year at no cost to the taxpayer. For antieviction advocates to focus on shuttles, rather than building more transit-oriented housing, is a tragic waste of energy. The frustration we are witnessing on the streets, train platforms, social media sites and coffee shops is the product of a generation of under-investing in housing and transportation. It is having a detrimental impact on the quality of life of everyone lucky enough to call this region home. Bay Area voters should demand a visionary expansion of affordable housing and an aggressive capital reinvestment in our public transportation systems, and be wary of activists and politicians who vilify the newcomers.